This is a set of subdued aviator (pilots) wings. They are black in color and have clutch back fastening devices on the reverse. They are new in the package. They are still mounted on their issue card and have never been removed from their plastic package. They were made by Volupte, Inc. and are dated 12/69. Grab a set while they last. This is a subdued Combat, Infantryman, 1st Award badge. It is black in color. It is new on its original issue card and in its plastic wrap. The reverse has two clutch back fasteners. It was made by Bell Products and dated 1969. I only have a limited quantity, so grab one now. For your consideration are a pair of transportation corps collar insignia for the enlisted ranks. 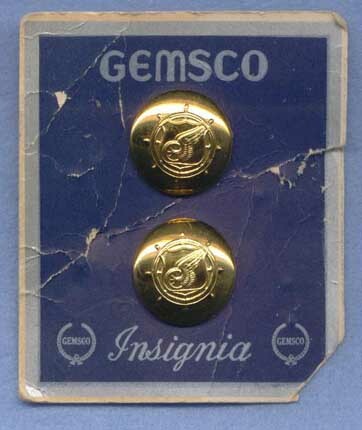 They were manufactured by Gemsco and are still mounted on their original issue card. The card does show some wear and tear, but the insignia are still gleaming. Each has a pair of clutch back fasteners on the reverse. These could date from the WWII through Vietnam. 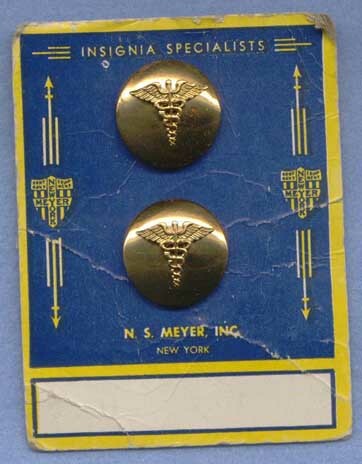 This is a set of medical corps collar insignia for the enlisted ranks. The top one shows a spot to the right of the caduceus. Other than that, they are in great condition. They were manufactured by N. S. Meyer, Inc. and come on their original issue card. These could have been issued between WWII and the Vietnam era. Each has a pair of clutch back fasteners to the reverse. This is a pair of artillery corps collar insignia for the enlisted ranks. 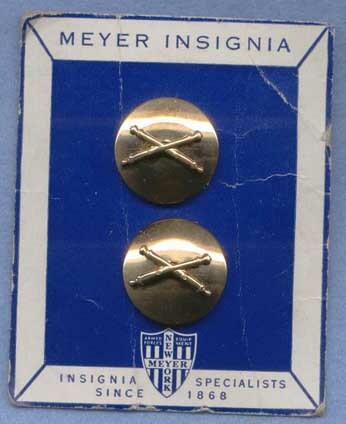 They were made by Meyer Insignia and come on their original card of issue. These could have been issued from WWII through Vietnam. 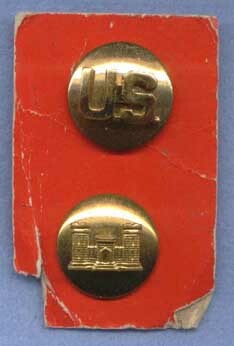 This is a set consisting of one U.S. and one engineer collar device for the enlisted ranks. Both are in great condition. These could have been used between WWII and Vietnam. They have a pair of clutch back fastening devices on each. I recenty acquired this SAC patch from a former Air Guard collector. This is an early patch dating from the late 50s to the early 60s (I would guess). I was told early 60s. It is not fully embroidered like the newer style patches. The background for the banner, around the arm, and the clouds are just cotton twill. It is also larger than the last current version of the SAC patch. From side to side on the banner, it measures approximately 3 13/16 inches and from the point of the banner to the top of the patch, it measures approximately 3 1/2 inches. The patch does not appear to have ever been applied to a garment. Other than a little yellowing with age, it appears in new condition. This is the first of its kind that I have come across. If you are a SAC collector, this one is right up your alley. 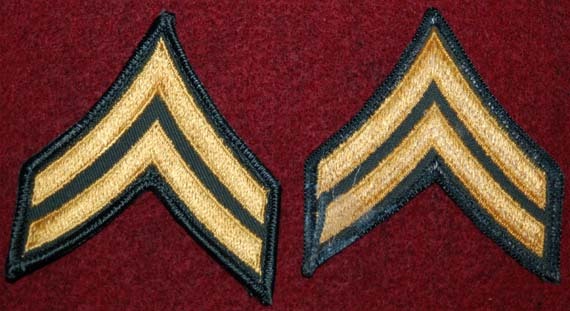 This is a pair of Corporal (E-4) stripes issued and worn during the Vietnam era. The front and reverse are shown in the attached photograph. These have never been issued.